Instagram model Cyn Santana managed to charm people as a YouTube sensation and model just at the age of 25. She won the hearts of many people from her videos where she showed realism with her bold acts and impressions. Cyn Santana has a vast presence on social media, earning over 3.3 Million followers on Instagram and nearly 600K followers on Twitter. She’s been featured in music videos of famous artists like Nas and 2 Chainz. Here are some wikis on Cyn’s on-screen life and off-screen life with her family along with her birthday, nationality, ethnicity and much more. Born in 1992, the Instagram star’s real name is Cynthia Santana, and she celebrates her birthday on October 20. Being born in New York, her nationality is American. Standing at the height of 1’6, Cyn describes herself as ‘mad Spanish.’ She is of Dominican and Salvadorian descent as her mother is from El Salvador and her father is Dominican. Cyn and her boyfriend, Joe Budden have shown no hesitation while showing how much they fancy each other. Joe Budden is an American rapper and songwriter whose debut studio album released in 2003 debuted at number 8 on the Billboard 200. The two started dating in 2016, which was a real surprise for fans because the two barely ever interacted during their season on Love & Hip Hop. Joe was the first one to reveal their relationship to the public as he informed how Cyn was planning a surprise to celebrate his 36th birthday. Cyn followed suit after Budden’s post and posted a deeply felt message alongside a birthday wish. The former Love & Hip Hop star announced that she was pregnant on 10 August 2017 on Instagram, multiple times. The couple posted a video to share their exciting moment and showered a lot more pictures confessing their love for each other, which was adorable. You Don't Want To Miss: Bobby Flay On The Other Side With Girlfriend After Divorce; Married Life At Rest! The pair named their baby boy, Lexington and had also opened an Instagram account for him. They can’t stop themselves from posting adorable pictures of their bundle-of-joy and melting their fans’ hearts. Joe, especially can’t seem to help himself but flood his social media accounts with his son’s cute pictures and videos. He is not a father for the first time. He’s got a son from his former partner as well. 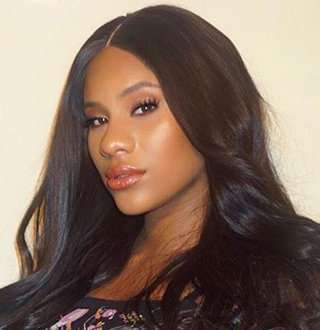 Even after becoming a mother, Cyn has continued to make her presence known in the social media, entertaining her increasing fans and pursuing her modeling career along. Having an ebullient personality, she proved her tenacity as a great video-humorist, Love & Hip Hop Season 4 novice, and an amazing singer. But the actual part that earned her the spotlight was when she made video impressions of very-known celebrities like Nicki Minaj, Ray J, and Kat Stacks, which pretty much pulled in puffery. Cyn has introduced her clothing line that favors women with curvy features and currently has a net worth of $300 thousand. Her fame and success are expanding with each passing day.